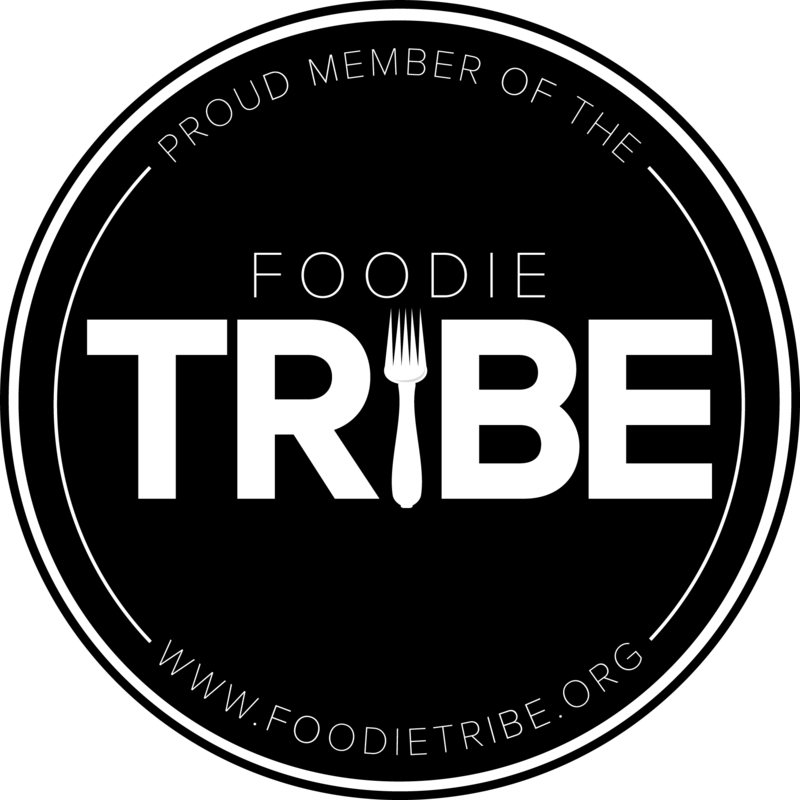 I love Italian food (authentic Italian food, but also the version we’ve created right here in America…we have a way of translating ethnic cuisines into less threatening, less exciting variations of the original, don’t we? Macaroni Grill, I’m lookin’ at you!). In fact, these days I have an Italian restaurant routine: I begin by dunking each piece of bread (from the never-ending bread basket) into a bowl of silky green olive oil, topped with salt. I order a small salad, then inevitably go for a bowl of pasta with seafood, delivered piping hot to the table and immediately hit with cracked pepper and a mountain of fresh shaved Parmesan. Just writing about it makes me weak in the knees. I rarely stray from these menu choices, which is why I hadn’t ordered – or even really considered – eggplant parmesan in years. A couple of months ago, I met a friend for dinner at Parm (it was good, but nothing exceptional). That night I was ravenous, and when my friend ordered the eggplant parmesan, I realized immediately that I, too, needed it. When our plates arrived, I played a polite game of fork and knife: delicately – slowly – slicing my first bite. I could only maintain such ladylike manners for a moment, and before I knew it I had cleared my plate. 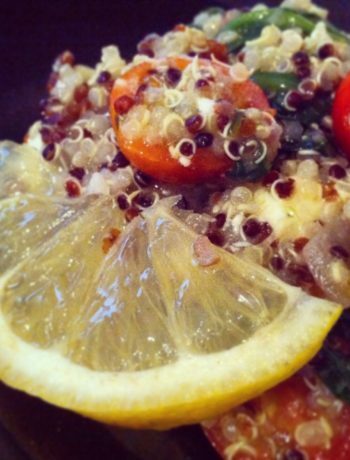 It was the perfect balance of meaty (though meatless), salty, and cheesy…and I fell head over heels in love. Fast forward to last night. 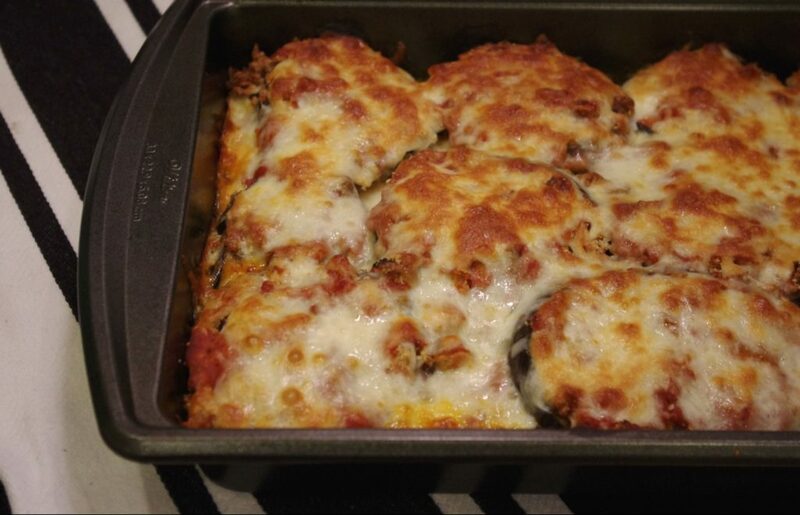 I was cooking dinner for the same friend and decided to recreate our eggplant Parmesan, albeit a slightly healthier version. 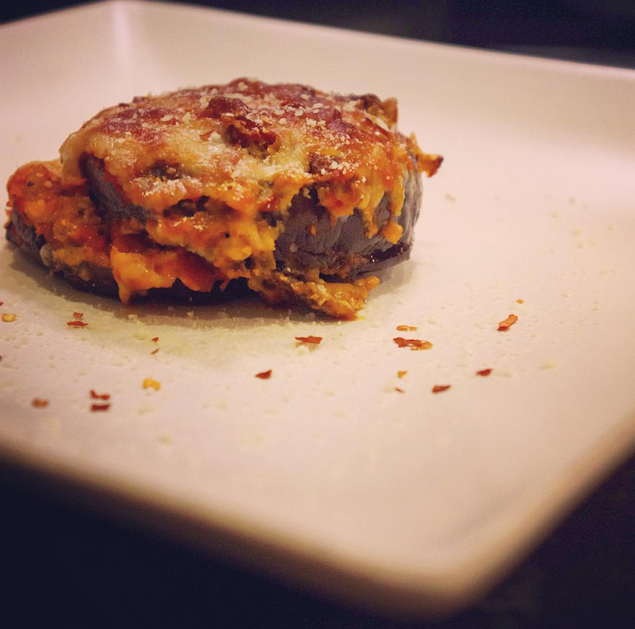 Anything with a full layer of melted cheese is only semi “healthy“, but by baking – not frying – the eggplant and by using lowfat cheese, I’d like to think I saved a few calories. 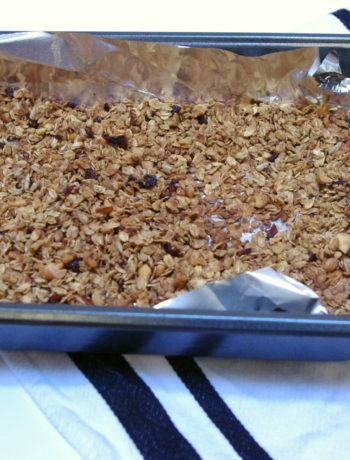 This recipe is surprisingly simple! It made enough for six large portions. There are two parts of this recipe that should be done in advance of the cooking. The first is salting your eggplant. Wash both eggplants and slice off the stem. Slice the eggplants into discs, a little less than 1 inch in thickness. 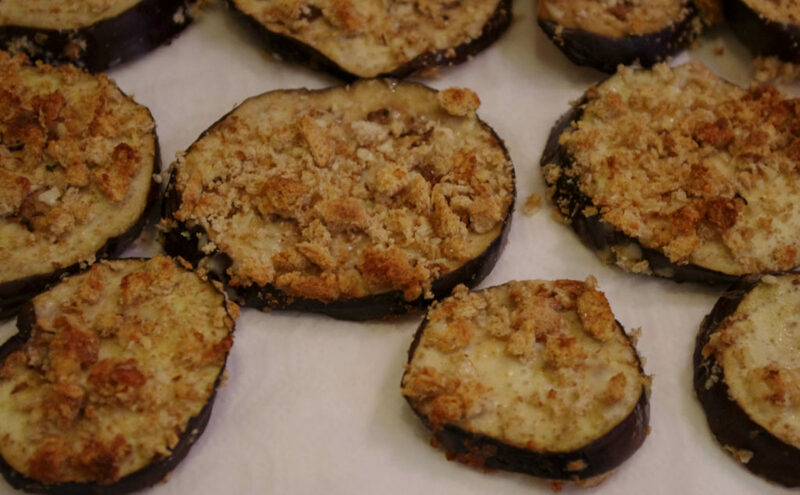 Using a colander and/or paper towels, sprinkle salt onto the eggplant rounds and let them sit for 2-3 hours. This will make them sweat out excess liquid, which helps with the cooking process. 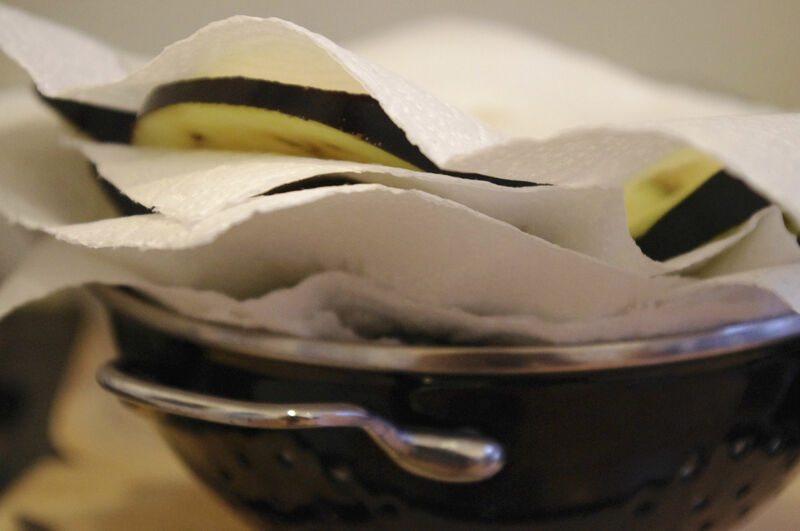 When your eggplant has completed its sweat, use a paper towel to wipe away the liquid and salt from the surface. 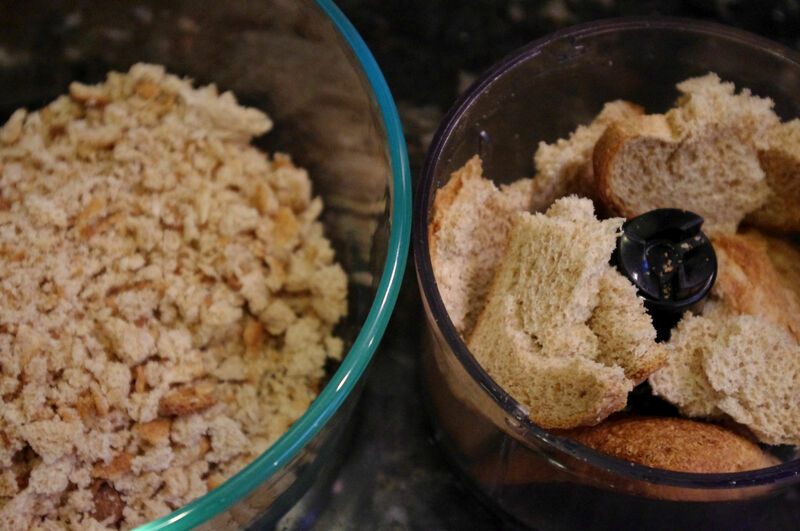 To prepare your bread crumbs, set out the bread slices, uncovered, for at least 3 hours. I did this overnight so they’d get extra stale. You can also purchase bread crumbs, but I tend to dislike the artificial herb salt flavor they add in at the store. With bread slices staled and eggplants dried, go ahead and preheat the oven to 420 degrees and spray a tray (or two) with baking spray. In a bowl, whisk together both eggs. In a blender or food processor, blend up the bread slices into small crumbs. Add in the Parmesan and continue blending. 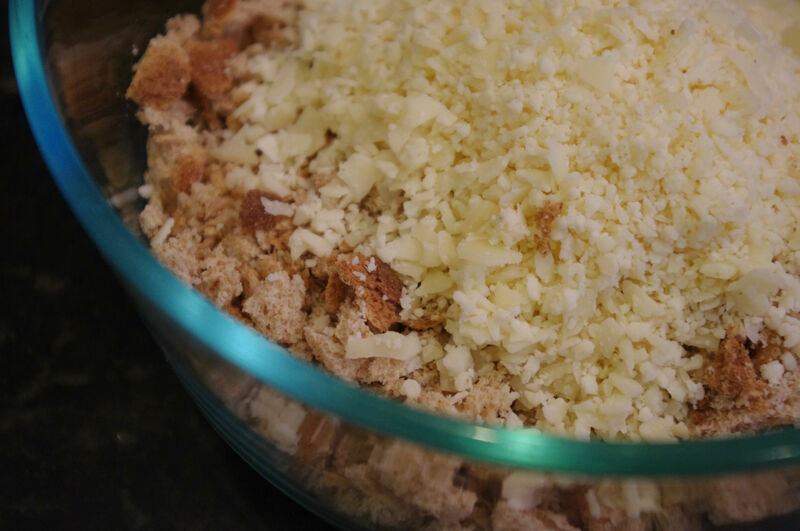 Pour this bread and cheese mix into another bowl. 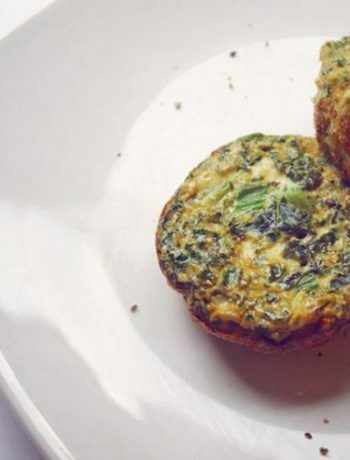 Carefully dunk each eggplant round in the eggs, then in the bread and cheese mixture. Plop the bread crumb covered rounds onto a baking tray. If you have room in the oven and two trays, spread them so that they are only one layer deep – if not, it worked just fine with them staggered and slightly stacked. Bake at 420 for about thirty minutes. The bread crumbs should begin to toast. Remove from the pan(s) and set aside. Slice the mozzarella balls into thin discs (I ended up with about 15 slices) and set aside. Pour about 1/3 of your sauce into the bottom of a 9×13 inch baking dish or cake pan. Spread the sauce evenly, then add in your first layer of eggplant, spacing them side by side to cover the sauce. Next, place a mozzarella disc on top of each eggplant. 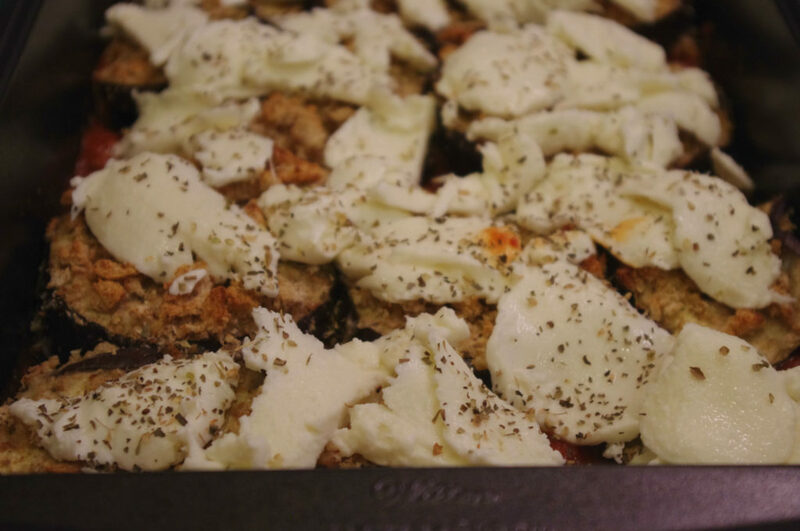 If you have any dried Italian spices, like oregano or basil, sprinkle some on top of the mozzarella layer. Next, add another 1/3 of your red sauce, spreading it evenly across the cheese and spices layer. Top this layer with the last of your eggplant. 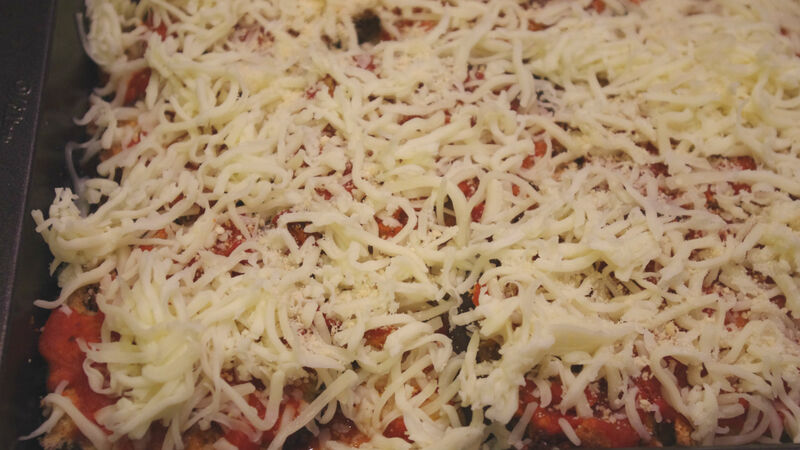 Add the last of your sauce on top, then cover that last layer with the desired amount of shredded mozzarella cheese. 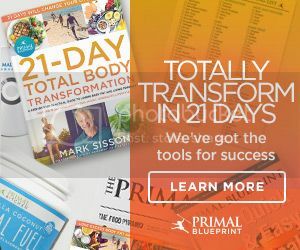 I’m going to be honest – I used the entire bag! Bake in the oven at 420 for about 15-20 minutes. If the top layer of cheese isn’t crisping or browning at all, feel free to finish with a five minute session under the broiler. I like my cheese a bit browned on top, so I did this. Thank you for the yummy eggplant parm! You write about the experience so beautifully, and I am hungry again looking at the photos!! !